I have a degenerative disease in my spine, called Diffuse Idiopathic Skeletal Hyperostosis (DISH), which makes me somewhat of an anomaly since the typical patient is male and over the age of 50, while I am female and only 31. Besides the drawback of having a degenerative disease in the first place, the greatest challenge has to be the lack of knowledge and research pertaining to DISH. I have found that many, even experienced clinicians, do not understand what it is. The danger in that occurs when they try to associate it with other diseases such as ankylosing spondylitis and degenerative joint disease, since the diseases are found within the same category of degenerative diseases. 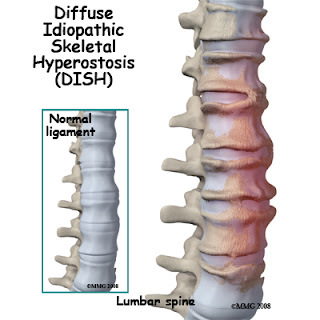 That is where the similarities end though, in that the treatment of patients with DISH is unique because while the other degenerative diseases cause breakdown of the joints in some way or another, DISH only affects a ligament called the ALL on the front of the spine and has nothing to do with the joints themselves. Most likely, this is not due to the fault of the doctors trying to treat patients with DISH, but rather due to the lack of research, especially in the way of treatment courses and in the areas of diagnosis and potential causes. The need for research is so important for people in my situation because when DISH is lumped into other categories, the tendency is for doctors to recommend the opposite of what I need and want to make me feel better, which should be the focus. Staying as flexible as possible by staying active and stretching, which, based on my personal experience, is an excellent recommendation for the management of DISH. Additionally, I am curious as to how many people out there may have this disease and not even know it because no one has ever looked for it. Who knows, maybe I am not an anomaly but instead, an overlooked population waiting to be discovered. It was only by accident that it was even found because I did not need x-rays; I just thought they would be cool to look at. Therefore, I would strongly recommend keeping an open mind, and for doctors treating and patients with DISH to document their findings whenever possible.